4-MeI is not federally regulated, but the International Agency for Research on Cancer lists it as a potential carcinogen (PDF). In California, products that expose consumers to more than 29 micrograms of 4-MeI are supposed to have a warning label, according to the state’s Proposition 65—yet none of the sodas that the group tested carried such a label. Dr. Urvashi Rangan, a toxicologist and executive director of the Consumer Reports Food Safety and Sustainability Center, believes that one reason for the New York samples’ relatively high levels of 4-MeI might be that New York doesn’t have a similar warning-label rule. The researchers found that the Coca-Cola products had relatively low levels of 4-MeI. On the other hand, some of the samples of Dr. 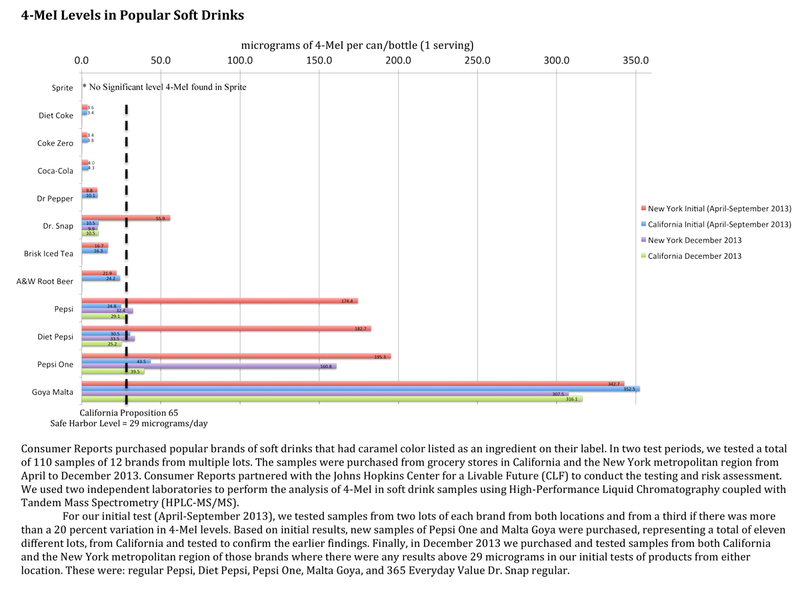 Snap, a soda sold at Whole Foods with a “natural” label, had levels that exceeded the California warning-label threshold. PepsiCo representatives told Consumer Reports that they don’t attach the warning label to their products in California because their research shows that consumers drink only about a third of a can of their products a day, on average—an amount that contains less than 29 micrograms of 4-MeI. The other brands whose products Consumer Reports tested have not yet responded to the findings.